Large compressors and pumps are the backbone of the oil and gas industry. Compressor systems are found in applications such as gas pipeline boosting stations, refrigeration trains at liquefied natural gas (LNG) plants, and a variety of applications in petrochemical plants, and refineries. Today, installations that use large axial flow or centrifugal compressors commonly have gas turbines as the prime mover. Gas turbines can run at high speed and have the convenience of using natural gas for fuel, which is often available at the site. Electric helper motors have been used in tandem to start the turbine and to provide additional power when the turbine power declines to less than the process demands. In the past, large compression systems utilized only reciprocating engines or steam turbines as the prime movers. The advent of the gas turbine with power ranges of 10 – 100 MW led to today's situation where most compressor systems in this power range have a gas turbine prime mover. Beginning in the late 1990's designs of VFD (Variable Frequency Drive) made it practical to use electric motors up to 100MW. Since then, large electric motors with VFDs have begun replacing gas and steam turbines for driving large compressors. In spite of power, speed, and fuel advantages of turbines as prime movers, the trend to electric motors and VFDs is accelerating and this paper discusses some reasons why the change makes economic sense. A typical gas turbine driven compressor train is shown in Figure 1. The electric helper motor rotates the turbine up to speed creating pressure in the combustion chambers. The gas burners are ignited and the compressor is loaded up. Power and speed are adjusted by opening and closing the gas valves to regulate fuel. Once the gas turbine has reached rated power, the starter motor is not required. However, the electric motor can be brought online as a helper when the turbine power declines to less than demanded by the process. A variable frequency drive, not shown in the figure, is used to smoothly start the helper motor. 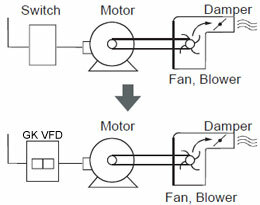 In Figure 2, an electric motor is started and run by a VFD. The starting current is controlled so that no large inrush occurs, which can result in overheating in the motor and a dip in the supply voltage. This capability of limiting inrush will save operations significant electrical charges. Generally, synchronous motors are employed for compressor power levels greater than 15 MW, though induction motors now range up to 25 MW. A speed increasing gearbox is typically required for standard speed motors like 1500/1800 rpm or 3000/3600 rpm motors. One of the advantages of using variable frequency drives on motors is that in many cases, the gear box can be eliminated by specifying a super high speed motor. Without a gearbox, the system efficiency increases 2%, however, there are tradeoffs with speed, cost, and power that have to be considered in order to determine if this is the best approach for the application. The two-pole motor shown in Figure 2 has a rated maximum speed of 4600 rpm for a 76.7 Hz input frequency, and is a direct drive solution with no gearbox. By using a high speed motor design with a variable frequency drive, motor speeds of up to 12,000 rpm can be achieved. Because the variable frequency drive controls the output speed, voltage, and motor torque, optimum control of the process is possible. Also, because the variable frequency drive has complete control of the load torque across the entire speed range, it is possible to start the process under loaded conditions. This enables the end user to avoid the gas being recycled, flared, or released in the atmosphere while the system is being started up. Sometimes these savings can be several hundred thousand dollars. The main operating expense of the plant is the cost of fuel. 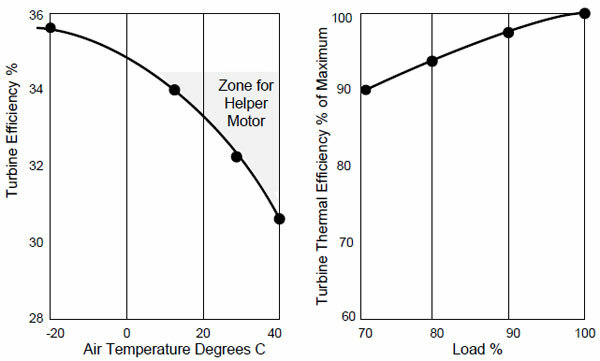 This can be illustrated by comparing the thermal efficiencies of the turbine and the VFD system as shown below in case 1 and 4. The VFD system has a 95% efficiency and the industrial gas turbine has a 36% efficiency. The higher the efficiency, the lower the fuel expense. When the energy efficiency of the electric power supply is included, the overall energy efficiencies are more equal, as shown in cases 2 and 4. If, on the other hand, the power is supplied by a co-gen plant then the VFD system has a much higher overall efficiency of 55%, see case 3. Gas turbines are sensitive to ambient temperatures. When the air temperature rises the efficiency and power decreases as shown in Figure 4. Turbines also lose efficiency at part load. When making an equipment choice, the above factors are considered for the main alternatives, and the Return-On-Investment (ROI) is calculated over a 20 year period to find the most promising solution. Table 1 shows the important consideration factors. Short starting time using the variable frequency drive. No bad effect on the power system. Helper motor is not required. High local CO2, CO, NOX emissions, and noise. Variable frequency drive has 8-12 months. The variable frequency drive has a 28 year MTBF, and only half day of downtime is required every 25,000 hours. The electric motor has a very high reliability (MTBF) and can run for years without maintenance. A gas turbine on the other hand requires maintenance every 4-8,000 hours and time consuming periodic major overhaul every three years. Therefore the VFD enables overall higher plant availability, greater gas throughput, and lower maintenance expense. Gas turbines vary in energy efficiency from 28% for industrial turbines up to 42% for zero-derivatives. The VFD has an energy efficiency of 94.5% and if the power station source has an efficiency of 40%, and the transmission 95%, then the overall VFD efficiency is 36%. If the power station has a 60% efficiency (Co-gen plant) then the VFD overall efficiency is 55%. 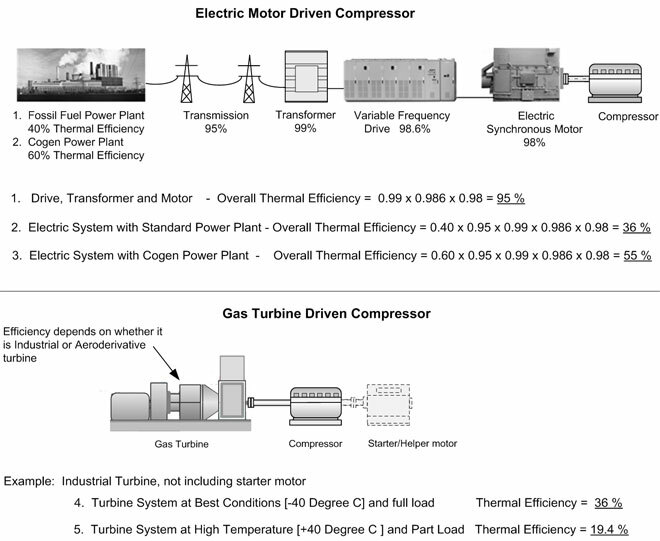 Therefore, depending on the type of gas turbine used and the type of grid power used, the VFD can reduce energy costs. In addition, unlike a gas turbine, the power delivered by the VFD is not affected by a rise in ambient air temperature so a helper motor is not required. Delivery of a gas turbine is about 18 months whereas delivery of a variable frequency drive and synchronous motor is 9 -15 months. Delivery of a large high-speed two pole synchronous motor is about 15 months, and delivery of a 4-pole motor is 9 months. Therefore a VFD can be delivered in a shorter time than a gas turbine, which reduces the overall construction schedule. There are no local air quality issues created by a VFD, whereas the gas turbine generates CO2, CO, NOx, and other emissions, including noise. Noise from the VFD is low, less than 80 dBA (how to reduce noise?). The most important advantage of an all-electric solution is high reliability and efficiency. Lower environmental impact is also becoming an increasingly important parameter during the permitting process which could kill a certain project if gas turbines are employed.